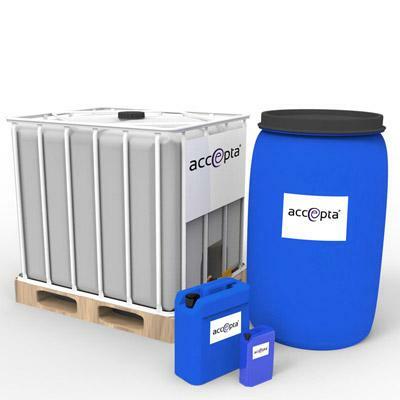 Accepta 2302 is a high performance non-oxidising micro-biocide that uses the latest chemical technologies for the rapid and effective treatment of cooling water systems. Accepta 2302 is a rapid-acting micro-biocide developed for use in cooling water systems and is effective against Legionella bacteria, SRB’s, algae and fungi. Accepta 2302 will also penetrate and disperse biofilm slimes making it an ideal cooling water treatment. Accepta 2302 has an excellent environmental profile and is readily biodegradable. Effective against Legionella, SRB ‘s, Algae, Fungi. Penetrates and disperses biofilm slimes. Excellent environmental profile (readily biodegradable). Accepta 2302 should be dosed periodically at a rate of 75 – 150ppm of the total system volume, that equates to 0.75 – 1.5l per m3 of water to be treated. In a badly fouled system, an initial dosage rate of up to 250ml/m3 may be required which can be reduced once control is gained. In order to comply with Health & Safety recommendations, Accepta 2302 should be alternated with another non-oxidising or oxidizing biocide.